Sitting At The Foot of the Mountain: HEY! Who Moved My Feeder? In a word, "wow." This has been quite the busy last few weeks. 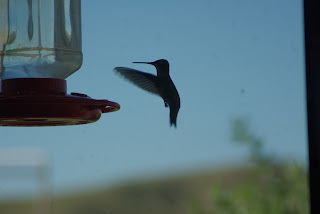 Once again, the hummingbirds have provided a good parallel to what I have gone through. Let's start with them. 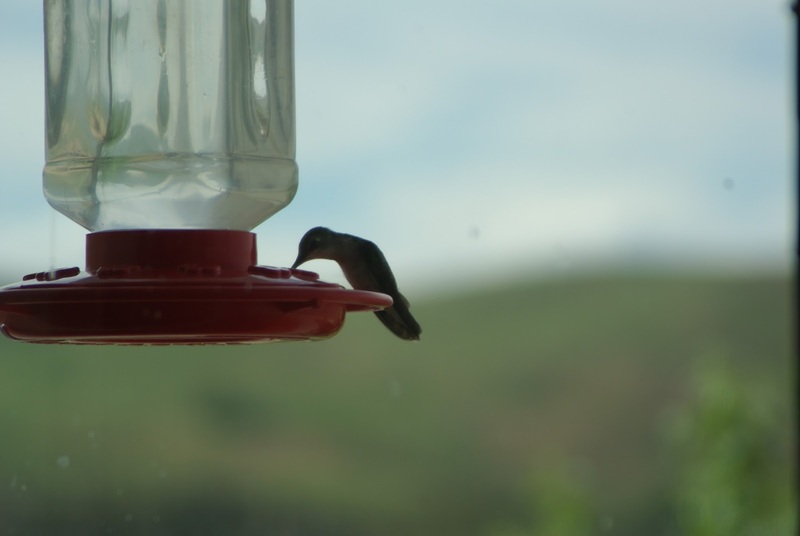 Originally, my hummingbird feeder was attached to my kitchen window. The benefits were many: I could get an up close and personal view of the hummies as they fed; I could take good pictures of them; and it is always a treat to watch their amazing wings finally fold--if only for a few seconds--as they lower their beaks into the feeder. They look around with sweet but anxious faces and their little feet cling to the feeder and then WHOOSH, they are gone. Hummies are like a shooting star--if you're not looking carefully, you will miss them. So my feeder allowed me to watch my "shooting stars." But there is one problem. The high winds we have up on our hill means the feeder may blow off and hit the ground, or all of the sugar-water splashes out, leaving a sticky mess on the window. So, after the last storm, I moved the feeder to the raised bed. Oh my, did I cause a ruckus in the hummies'world. One particular male--a black-chinned hummingbird--was especially irked. He flew several times up to the kitchen window, hovering and looking in. He had the "HEY! Where's my feeder?" look in his wee birdie eyes. He kept flying around and was joined by a few equally confused? irked? female hummies. I was waiting for a phone call from their lawyer--a loud humming sound over the phone would be a dead giveaway. Yet, the feeder isn't that far from its original site--I moved it only about ten feet. It is still full of yummy sugar-water. Nothing has really changed in my mind--same feeder, same water, just a different spot. But to the hummies? Everything has changed. And so onto my world. My husband, for the last few years, has had occasional shortness of breath. His doctor attributed it to the cold dry air. He was getting increasingly tired. We attributed that to getting older. Then, last month, he was afflicted with a kidney stone, whose pain sent him into the ER and into a procedure to blast it away. It was 7 millimeters, so he wasn't going to pass it for love nor money. In the course of all the tests being run in the ER to determine what was wrong, the nurses noticed his heart sounded funny. So, after the procedure for the stone, we now switched gears to understand why his heart sounded odd. Long blog short: his aortic valve needed replacing. My husband is only 56, so we were a bit shocked. It is either a congenital defect or the result of a high fever he suffered as a young child. Either way, the doctor said that surgery was the only option. Wow. Thankfully, it was not the open-heart kind of surgery--the doctor would put in the valve via an incision. So, one week ago, my husband went in and had the valve replaced, and is slowly but surely, recovering. We really had our feeder moved: one minute we are enjoying the summer and then WHOOSH: kidney stone, angiogram, and then heart surgery. I flew up to my Lord's kitchen window and looked in. I wasn't angry--just perplexed. But I am thankful, for without the kidney stone and the resulting tests, Clayton may have found out about his wonky heart in more of an emergency situation. I am thankful I have my Lord's kitchen window available to fly up to; I cannot imagine facing those long hours in the corridors and waiting rooms of the hospital alone. Our family and friend have been lovely--prayers, emails, cards and lots of love have come our way. But having your feeder moved is never easy. 1. Feeders get moved: Sometimes we are privy to why, but most often we are faced with a challenge with no easy answers. And yet, Jesus is standing there, moment by moment. 2. Jesus uses people to speak to us--a stranger, a loved one, a distant friend. Allow Jesus to use those around you to be His hands and feet. 3. Trust that a moved feeder is not an absent feeder: Jesus is still Lord, He still loves us and is still bringing beauty from ashes: "And we know that in all things God works for the good of those who love him, who have been called according to his purpose." (Romans 8:28). Notice something here: not everything is good that happens, but God can transform the negative into the good. Only He can do that and trust Him to do so. 4. God is speaking, whenever you and feeder are. He is never absent: "Be strong and courageous. Do not be afraid or terrified because of them, for the Lord your God goes with you; he will never leave you nor forsake you.” (Deut. 31:6). Feeders move, but "Jesus Christ is the same yesterday and today and forever." (Heb. 13:8).